When Tales of Innocence R (R standing for Re-imagination) came out in Japan some people found some very interesting images inside the game: One pointing out Innocence R was not going to be the last re-imagination title on the series and the others suggesting that said title would probably be Tales of Hearts, the eleventh Mothership title in the Tales series, a DS exclusive that never left Japan and the game that Tales series producer calls his favorite one. 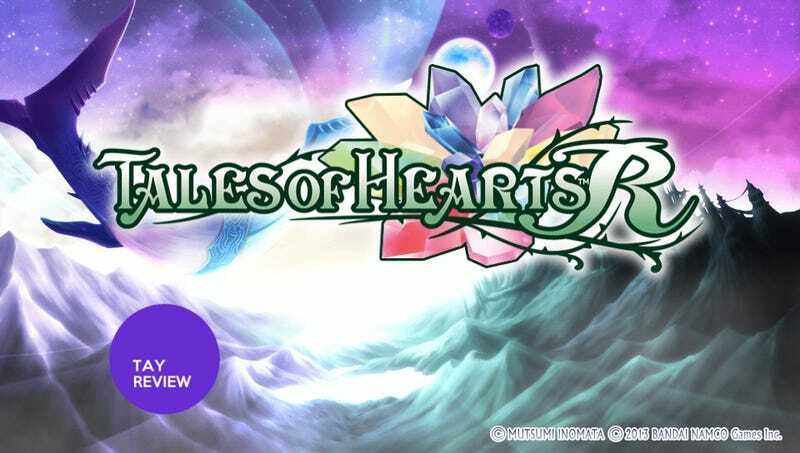 Some time later the rumor became true and Tales of Hearts R was announced for the PlayStation Vita, promoted as a total overhaul of the original DS title featuring an extended storyline and new characters. After the clamor of fans of the series around the world a localization was finally announced and the title finally arrived. Was the wait worth it? The story follows Kor Meteor, a boy who lives with his grandfather in a little town while training his Soma, an ancient weapon designed to fight Xerom, a type of monster that infects people's Spiria, which contains the essence of the emotions (think of a similar concept to heart and soul). One day Kor discovers a woman named Kohaku Hearts and her brother Hisui near his home town who ended up in the sea while running from a witch called Incarose. When Kohaku is attacked once again by Incarose and infected with a Xerom, Kor attempts to cure her using his Soma. In the process though, he ends up shattering Kohaku's Spiria, and scattering the pieces across the world leaving Kohaku as a human without emotions or feelings. So together with Hisui, Kor sets off with Kohaku on a quest to restore her Spiria. What starts as a simple quest to recover her Spiria piece by piece, becomes so much more after discovering that the reason she was chased is that her Spiria is special and we also find out that Kor's involvement was no coincidence. Throw some (un)expected revelations that will put our characters will to test and we have the story of two people growing and falling in love while overcoming the adversities that are thrown at them. While I have to admit the pacing of the first half is somewhat slow, once the plot gets going, it becomes hard to to put the game down. After the more mature and dark themed Tales of Xillia 2, this story about human emotions and the focus on the nature of the heart is a more than welcome change of pace. Tales games are full of tropes found in modern JRPGs and Anime, but what sets them apart are the interactions and growth the characters go through during the story. From the big sister-like Ines who has a deep and complex past to Beryl, a painter in the making with a penchant for comedy and getting into trouble, we have a very colorful cast with a great chemistry between them. Also the main heroine Kohaku is a very interesting case of character development, caused by the fact that she loses her emotion at the start of the game and as the player advances the story and recovers those pieces little by little she starts to regain her feelings while at the same time growing as a character in her Journey. Tales of Hearts R features one of the most likable and cohesive casts in the series. One of the common complaints in the series is the AI of your party members, but this game features a lot of customization in that regard, which helps in making them doing what you expect them to do when certain conditions are met so this is a welcome addition. As for the level up system we have something akin to the Lilium Orb system from Tales of Xillia which lets you invest the points you get by leveling up in increasing one of five different categories which in turn affect a set of different stats and unlocking rewards like weapons, skills and enhances. It's a pretty friendly and easy to grasp system, but has a certain level of complexity to it. Speaking of features, while Tales of Hearts R is reminiscent of some of the older titles in the series for its story and characters, it also brings back a couple of features of classic games in the series like the cooking system (and the Wonder Chef) and one in particular which I'll leave for later. But the game system is pretty solid. Another staple in the series is the Skit system, which are these short, optional scenes that are animated in an anime cutout style, providing additional dialogue and interactions for the party outside of required story scenes. As I mentioned Tales of Hearts R has one of the best casts in the series and the Skits are a great way to see our characters interact, and grow close to each other slowly while being fleshed out at the same time. They are full of fun, deep and dramatic moments between the cast and are a delight to watch. Tales games are known for their fast-paced, action-packed, real-time combat system which feels more like a fighting game than a traditional JRPG. The game features a system called the Aerial Chase Motion Linear Battle System which is similar to other 3D titles in the series, but with a few tweaks here and there to make it different, like giving aerial combat an important role in battle. One of the new features is the Chase Link system, in which after dealing a certain amount of damage to an enemy a marker would appear on it letting you enter Chase Link Mode in which the enemy would be rendered defenseless and you can instantly teleport next to him giving you an opportunity to perform an offensive onslaught with large combos. Also we have the Guard Counter which lets you counter certain attacks from your enemies and transform them in a combo opportunity for your party. Since it depends a lot on timing and getting to know the different monsters, it helps in giving more depth and variety to the combat system. Tales of Hearts R is a complete remake of the original game. 2D graphics and chibi-models haven been replaced with new 3D models and environments. The story has been extended and modified to accommodate a brand new character (technically two, but the other is a returning character becoming playable) and there are a lot of new Anime cutscenes and Illustrations to enhance the experience. Some gameplay elements have been modified like having a 4-character party in combat (the original was a 3-character party), being more similar to a console release in that sense and on top you can choose how many members will participate in battles (from 1 to 4). So even if you are familiar with the original one, this game offers a completely new and revamped experience while maintaining the same atmosphere of the original. Composed by series veterans Motoi Sakuraba and Shinji Tamura (credited as Hibiki Aoyama) alongside Hiroshi Tamura we get a completely remastered soundtrack and while it won't blow anyone's mind, the music goes hand in hand with what's going on in the game and it never feels like it's getting in the way. Special mention goes to the battle tracks, which are always very in tone with the fast-paced action-packed combat system the series is known for. All in all we have a very sold music effort that helps you enjoy the game and if you're a longtime fan of the series, you can pretty much know what to expect. Normally Tales games are pretty straight forward, and Tales of Hearts R is not the exception. It mostly follows the standard Town-Dungeon-Town formula and the dungeons are pretty linear too. It's pretty easy to see where you can and can't go both in the world map and in the dungeons, and the puzzles feel like they are trying to slow you down more than being an actual challenge. The enemies you'll find on the world map and dungeons are largely uninspired but fortunately the fun combat system makes up for it by giving you nice breaks from the repetition. In a first for the series, the game was released with only the Japanese voice-overs and I couldn't help but notice the differences between the spoken audio and the text dialogue. Starting with the weird fact that Kor's original name in Japanese is Shing, you'll have to get used to characters referring to him as Shing and not Kor (even more weird was the fact that Kohaku's name was translated as Amber in a cameo appearance she did in Tales of Graces F but she retained her original name, so why they didn't do the same with Kor/Shing?). If you have a little familiarity with Japanese you will notice how the English subtitles make the characters sound more rude and less innocent than the original script. Even if you're not familiar with Japanese, it's easy to come across some instances in which two words in Japanese transforms to a whole paragraph in the subtitles. As we normally only get the English dub (Tales of Symphonia Chronicles being the exception) we don't even realize this happens unless we play the original Japanese version, so in that sense it's not that bad. I mean this is not Sword Art Online: Hollow Fragment level of awfulness since the script is solid and makes sense, it's just that it's pretty different in tone and personality with the original one and Bandai Namco really needs to work on this (And I'm not the only one that thinks the script was actually made with the Dub in mind so that's probably the cause). The other thing I noticed was that the Opening track was replaced with an instrumental version like in older games in the series, but taking into account that we recently got either the original versions, or English adaptations sung by the original artists this feels more like a matter of both budget or copyrights, but it would've been nice to retain the original song by DEEN. That being said, getting to hear voices like Hiroshi Kamiya and Marina Inoue was a welcome experience and I really want this to happen more often. I talked about how the game brought back some of the older mechanics of the series, but bringing back invisible random encounters felt more like a step in the wrong direction, especially since the recent entries of the series have fixed that and the fact that it was NOT present in the original DS version. Now, this wouldn't be such a big problem if not for the fact that the rate encounter is pretty high, and the way some dungeons are laid out, you will have to go back and forth a lot, so the continuous encounters would start to get really annoying after a while. Even when using a Holy Bottle (the franchise's staple item for avoiding enemies) the encounter rate feels high and the developers seems to acknowledge this, as they created a more powerful version of the Holy Bottle, the Sacrosanct Bottle which completely stops random encounters. Tales of Hearts R is a very solid entry into the JRPG genre for the Vita but one that is not without a couple of hiccups. The game would not change anyone's perception about the genre, but the solid story, the enjoyable characters, the polished combat system and some other staples in the series makes for a great Tales experience for both veterans and newcomers alike and best of all, you can have play this on the go, so it's more than worth a try.